You don’t have to have some special degree in order to be a creative cook. It does help to have some basic skills, a bit of creativity, and a dash of common sense though! That means that when I’m contemplating creating something new, I know that a sweet pie laced with salmon and cinnamon is not likely to be successful, and that combining flavors before getting too involved with a recipe might be a very good idea. Last night, I dreamed about the creamy flavor of buttermilk custard with a healthy dose of banana, along with cinnamon, sort of reminiscent of bananas foster without the expense and complicated recipe. This was a step up from last year’s Po’ Folks Banana Foster Crisp, but still not getting into the category of complicated OR expensive to make. If the recipe works (it’s in the oven right now, but we still have to finishing baking and cool it before sampling!) it’s fancy enough for company, quick enough for a weeknight family dinner, and easy enough for a novice cook to make. Oh, and I did “cheat” and use refrigerated pie crust…and simply put it in the pan, no crimping or other fancy edge effects. I just wasn’t up to the mess and effort of making and rolling out pie crust this morning! Unlike Martha Stewart, I don’t have staff, and some days are just not as good as others, in terms of physical effort. While I can make excellent pie crust, not everyone can, whether they are having a “good day” or not, and the modern refrigerated pie crusts are better than a bad homemade one. I recommend the kind that comes rolled up in the box, allowing you to use your own pan, and recreating that homemade look far better than a preformed frozen crust ever will. In addition, I have found that these crusts are much better than those preformed frozen ones. So, if you aren’t practicing your pie crust skills, are not up to the effort of homemade crust, or just don’t have time to deal with that part…don’t feel guilty about opting for the quick & easy solution with a pre-rolled crust! Crust. It may need a 2 crust or streusel topping to get the right texture on the combination of custard & bananas. Sugar. It may need more or less sugar, which can be tricky because the sweetness of the bananas can vary considerably. Lemon juice. I included it because my “base” recipes for buttermilk custard all included it. I’m not sure about its addition, but it’s still there. It may need eliminating or increasing, as we adjust the tart/sweet factors in the custard-banana combination. Rum or rum flavoring. I didn’t include any, mostly because I didn’t have either one on hand. I used vanilla, cinnamon and lemon juice. Baking temperature. I baked it at 350 degrees F. It may need to be slightly lower heat. With those things in mind, I just peeked at my beta pie. Small bubbles are coming up through the filling to the surface, and the sugar topping seems to be vanishing, leaving only the cinnamon sprinkled on top behind. It smells fantastic, and my coffee seems a bit lonely without a piece of something wonderfully banana & cinnamon-ish to accompany it. If you try it, post a comment and let me know what you think of it! Line pie plate with pie crust. Set aside. Combine brown sugar, flour, and 2 tsp. cinnamon in medium bowl. Add two eggs, vanilla, and lemon juice. Beat lightly to combine into smooth mixture. Pour mixture into pie crust. Cut bananas lengthwise in half, then slice bananas about 1/4″ thick. Sprinkle chunks of bananas over custard, using a fork to press them lightly down into the custard if necessary. Sprinkle top with sugar, then with cinnamon. Place pie in oven and bake for 45-60 minutes or until knife inserted in center comes out clean. Cool to barely warm before serving. Update: The pie has been sampled, and believe it or not…it’s barely sweet. The bananas remained firm with an element of tartness, which was also surprising. I would suggest using 1 c. brown sugar, and increasing the sugar on the topping to 1/3 c. Quartering the bananas lengthwise, then slicing them to create 1/4″ cubes might also be more appealing, as would simply laying in the quartered bananas. A cookie crust which typically is just pressed into the pan (and eliminates the rolling out part) might also be a good idea, along with a cinnamon streusel topping. For my tastes, there wasn’t quite enough cinnamon in the pie, or else my cinnamon was getting old. (Aging spices lose their potency.) To recreate the richness of bananas foster, the pie should be sweet and intensely flavored, requiring the serving size to be small This version missed that mark. Obviously, I’ll have to come up with the Beta Version 2.0! 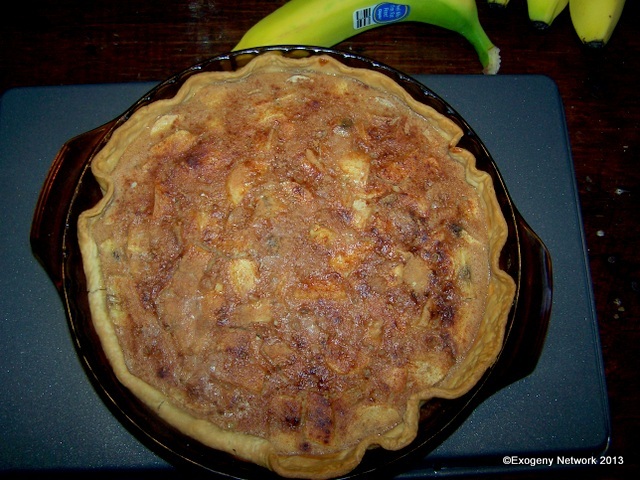 This entry was posted in Budget, Desserts, Easy, Entertaining, Ideas, Pies, Recipes and tagged banana, budget, buttermilk, cinnamon, custard, dessert, easy, family, old fashioned, pie, recipe, recipes. Bookmark the permalink.